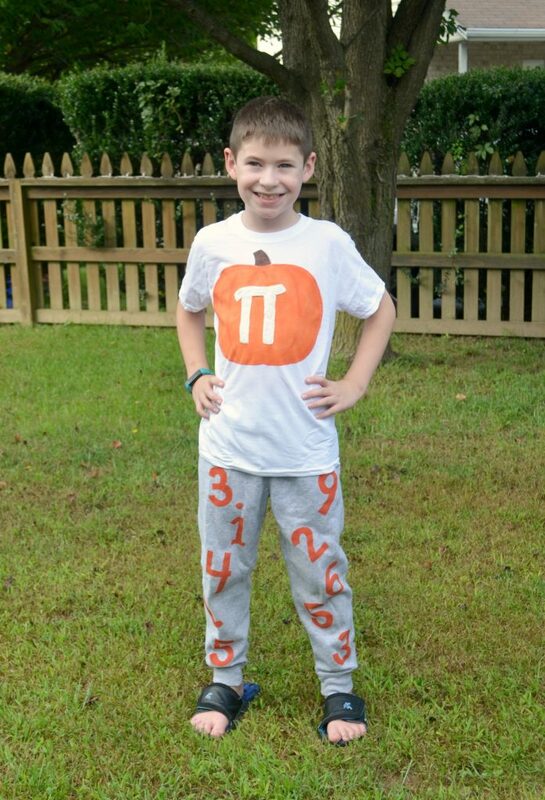 Since my kids aren’t little anymore, we aren’t doing costumes around here. But that doesn’t mean that I’m not up for a little Halloween fun – especially if it involves a new pair of shoes. Add in a little glitter too? I’m there! 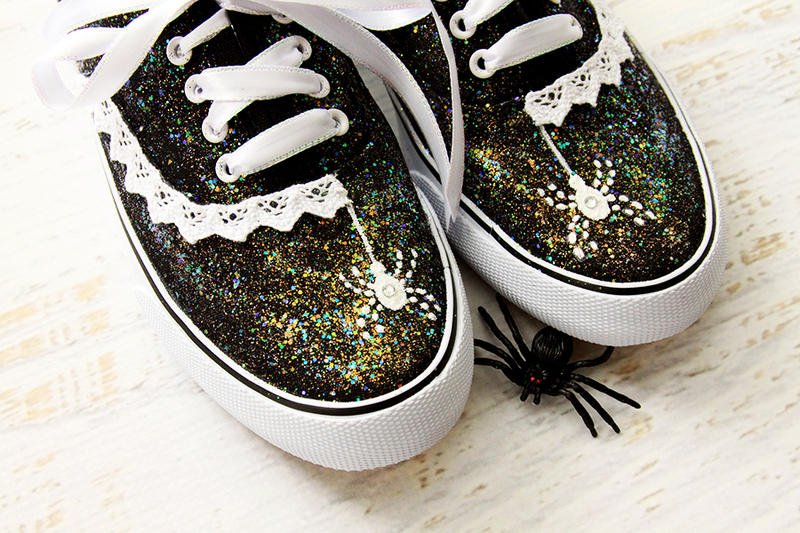 These DIY Glitter Spiderweb Halloween Shoes are so fun to make and the perfect way to show off a little Halloween style without wearing a costume! 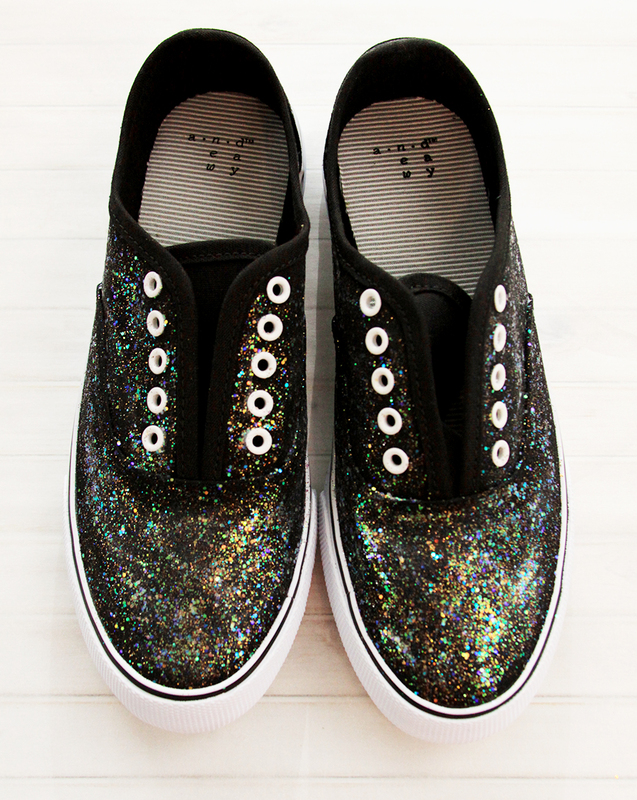 These shoes have the most gorgeous glitter look to them! I feel a little like Dorothy wearing them – if Dorothy was in the Addams Family. They are so simple to make up too! 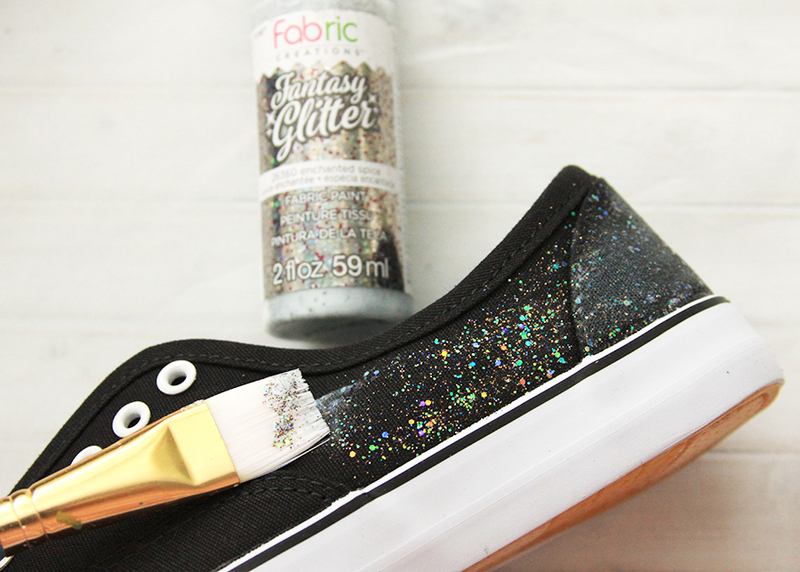 I used the new Fabric Creations Fantasy Glitter and Plush paint . . .and now I want to glitter all my shoes! Begin with your plain pair of tennis shoes. 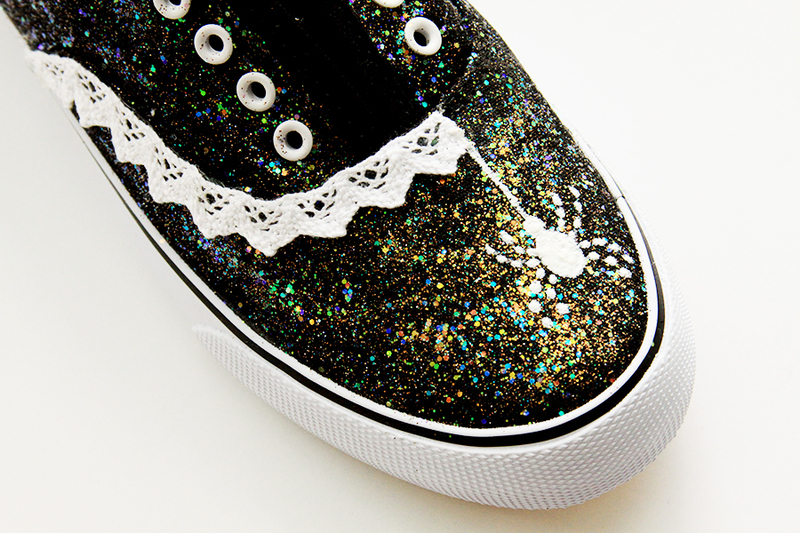 You’ll need to remove the laces to keep them from getting all glittery. Brush on a light coat of the Fantasy Glitter all over the show, except for the trim around the top edge. The more paint you brush on, the more glittery they will be so you can add more coats if you’d like. 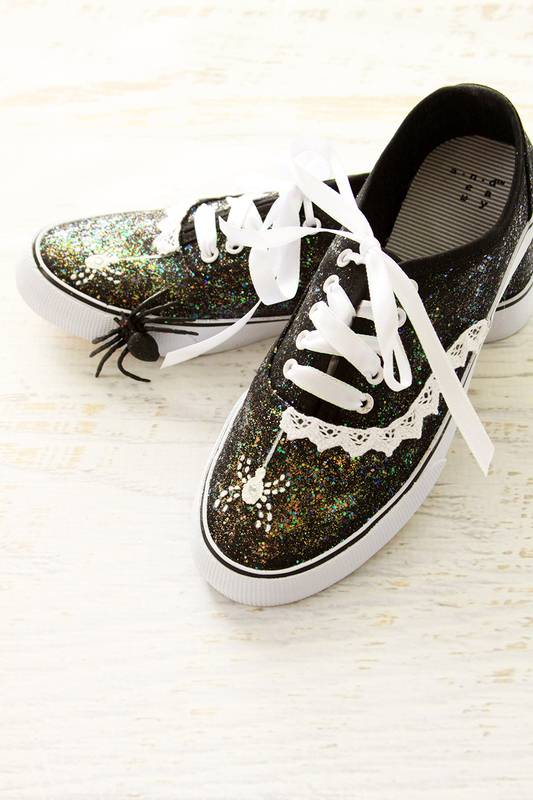 The Fantasy Glitter works great on light and dark fabrics so you could totally do white shoes too! 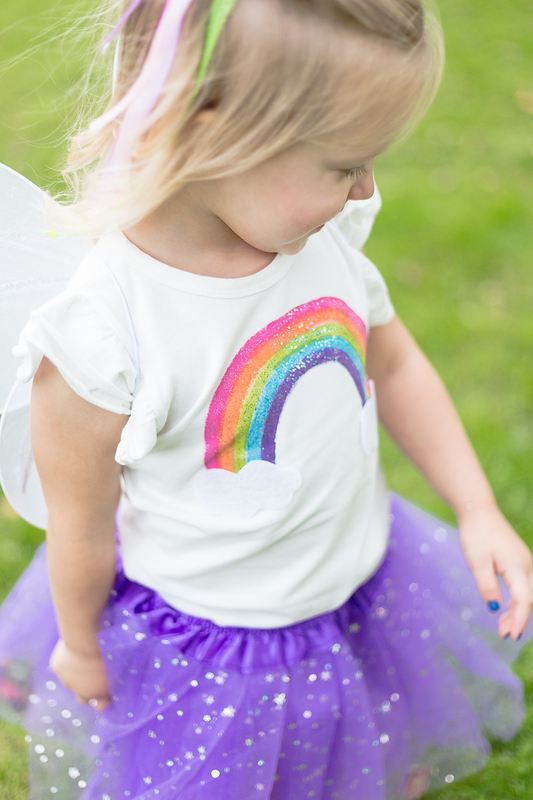 Clean up is super easy as well since it’s water based and non-toxic. It works on clothing as well! It’s machine washable after curing and heat-setting. Woohoo! Once your glitter is pretty dry, paint on your spider with the Fabric Creations Plush. I used a fine brush to draw a line down from the top of the show to the spider. The legs are just little dabs of paint. If you want a nice puffy look to the plush, make sure you have an even coat on the body of the spider. Let the Plush dry for 24 hours. Once your paint has dried you can iron the toe of the shoe so the Plush paint puffs up a little. Use a pressing cloth over the paint and steam the spider for about 30 seconds. It will give the spider a little extra texture. So cute!! The Plush is also water-based and non-toxic and machine washable as well! 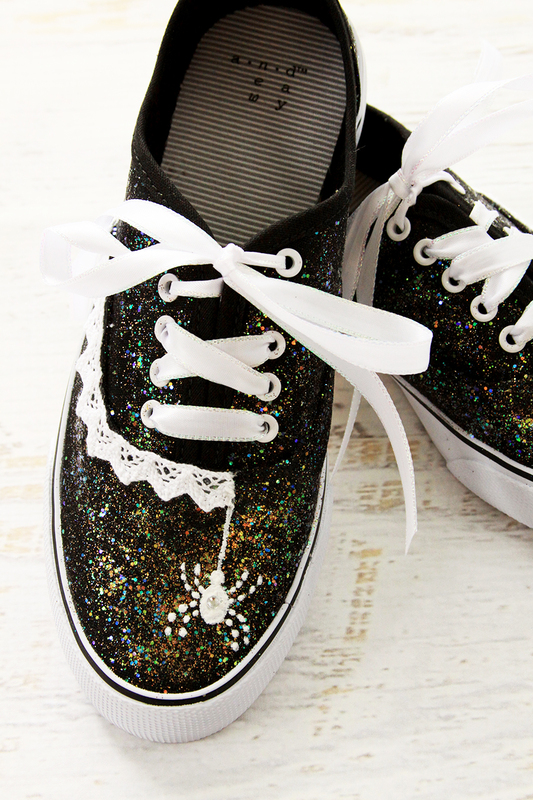 Glue a piece of lace along the top curve of the shoe, starting at the spider’s web line. Run glue over the ends of the lace to seal them so they don’t fray. Add a small rhinestone to the center of the spider to give her a little more flair. Cut the coordinating ribbon to the correct length of your laces and lace back up the shoes. 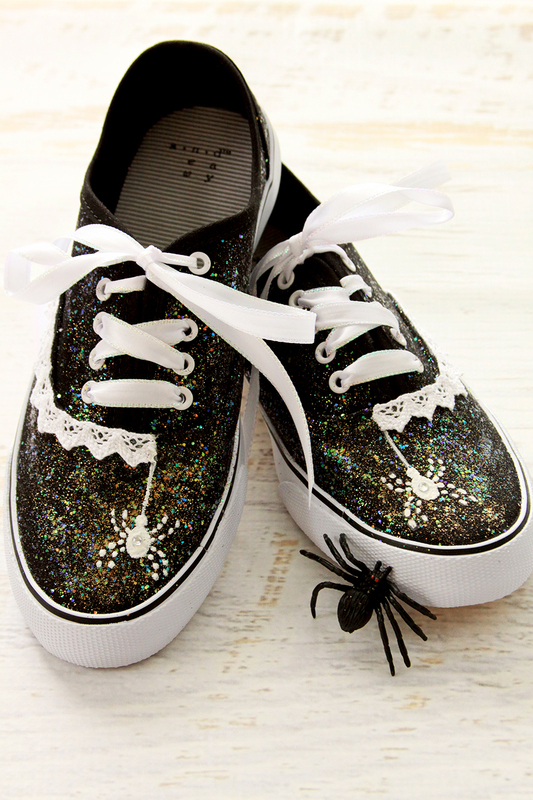 Show off your glittery Halloween style! 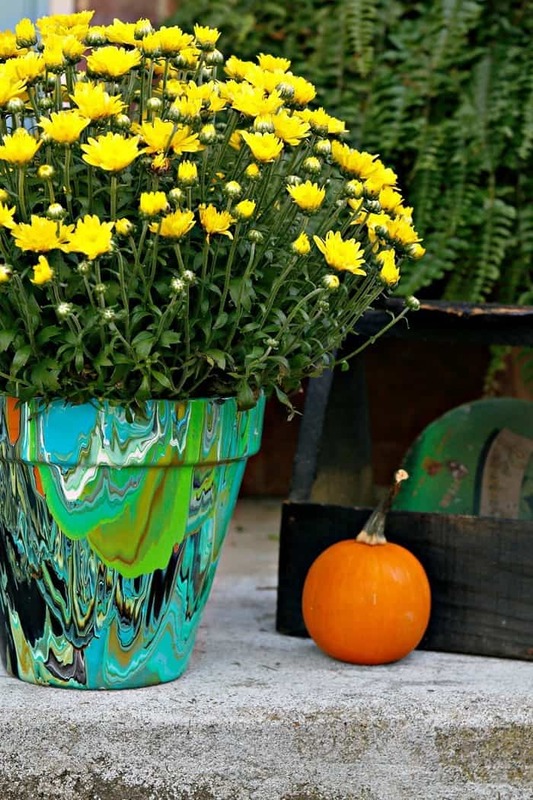 Check out more fun projects from the other Plaid Creators! 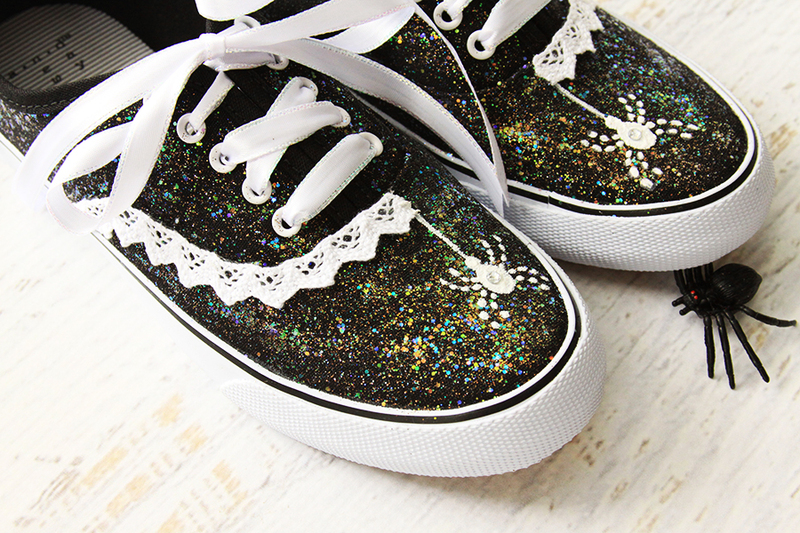 Oh my goodness, I want these so bad! Love it! 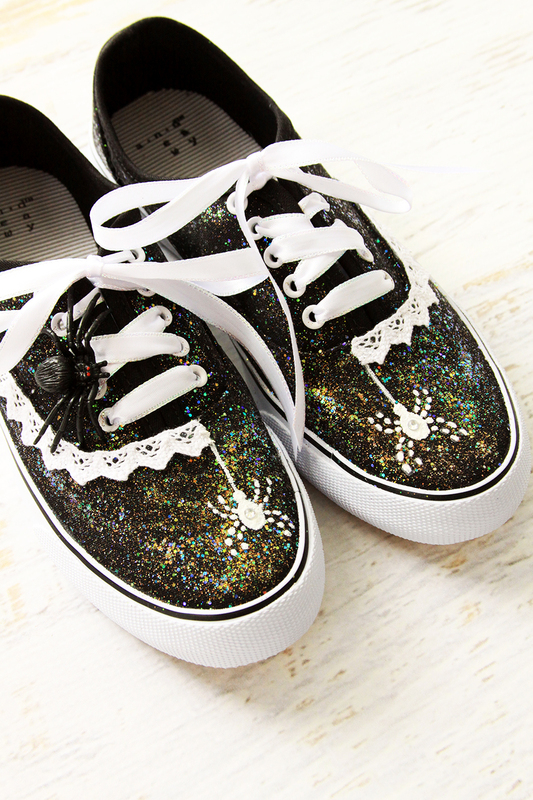 These sneakers are ADORABLE …I love them! I need to upcycle a pair of shoes for Halloween. How easy and fun! Thanks for sharing at the Inspiration Spotlight party. Pinned and sharing. The sneakers are everything! 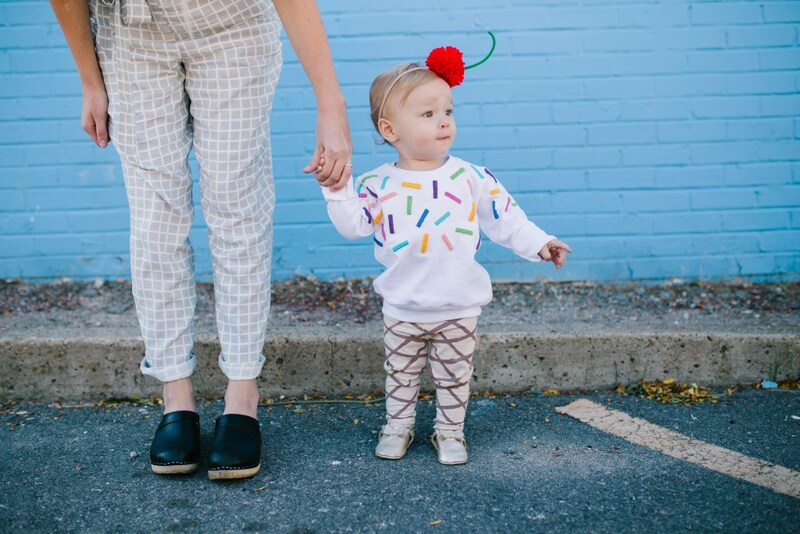 Perfect with leggings, jeans, or a Halloween Costume. Thanks for sharing on Sunday’s Best.